CRUSHERS GRAPE Contacts for the order: mob.tel. : + 373 - 691 - 07 - 891; tel/fax: + 373 - 22 - 47 - 63 - 51;e-mail: 777-tehmarket@mail.ru; Moldova, Chisinau, Mesterul Manole, 9; "777 si C" S.R.L. Video: "The press for grapes of grape grinder...". THE PRESS FOR GRAPES Contacts for the order: mob.tel. : + 373 - 691 - 07 - 891; tel/fax: + 373 - 22 - 47 - 63 - 51;e-mail: 777-tehmarket@mail.ru; Moldova, Chisinau, Mesterul Manole, 9; "777 si C" S.R.L. 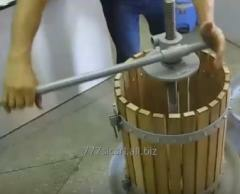 Video: "The press for grapes, grape grinders..."
Unbelievable price on Equipment for winemaking in Chişinău (Moldova) company 777 si C, SRL. Wide choice of quality products at affordable prices.